I made these with the intention of putting cupcakes on them, but I didn’t see any nice premade ones at the store. So, I bought some mix and all. Of course, I didn’t have any cupcake liners when I got home! So I just cut up the cake showing you could put something besides a cupcake on them. I know the idea isn’t new, but I have never seen anyone decorate the glasses or put things underneath of it like this. I wanted to share that with you. Here is a brief how to that will help you get going if you would like to make something of the sort yourself. 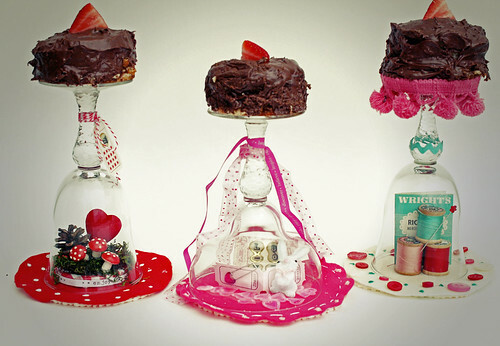 It’s a great way to add a lot of personalization to your dinner table or party. 1. Gather your supplies. I started with the basics and then added as my creative juices began to flow. I’m one of those who needs to see it in front of me to put it together. I cannot just picture it in my mind usually. 2. 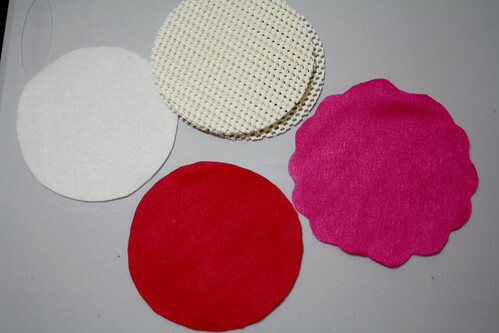 Cut out felt circles to cover the grips if using them. Glue the pieces together. Decorate the felt in any way you like. 3. Glue the middle scene onto the middle of the felt. Make sure the glass will fit over it fine. 4. 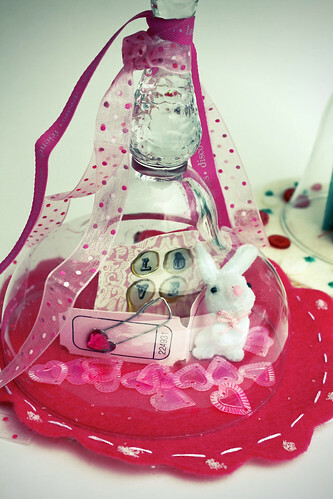 Decorate the glass with paint, ribbons, trim, etc. 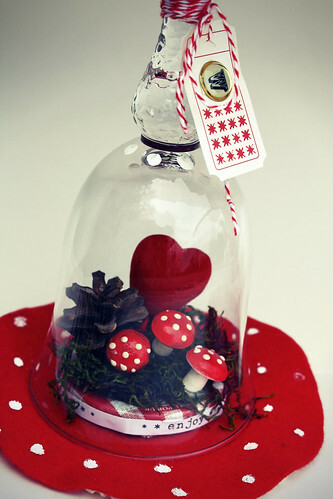 I glued the mushrooms, moss, pine cone, and heart pick onto a lid from a jelly jar. I added a paper ribbon around it for embellishment. The string, ticket, and W were embellishments from scrapbook packages from Michael’s. I also added paint dots to the glass and the felt. I tied ribbons around the neck and glued a vintage bunny figurine with scrapbook embellishments onto it. I sewed around the edge of the felt and added some glitter as well. I glued on buttons and embroidered on the felt. The middle just has some old thread spools I have with a vintage ric rac paper cover behind them. 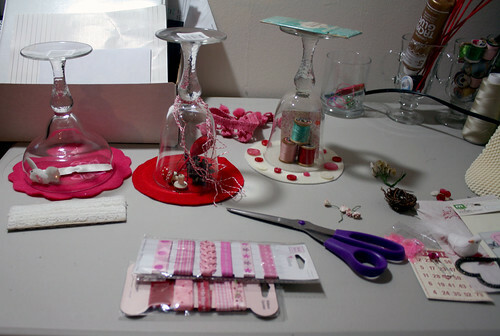 I glued on ric rac and pom pom trim to the glass. I’ve seen this in Rachael Ray’s Mag, but yours came out really nice. 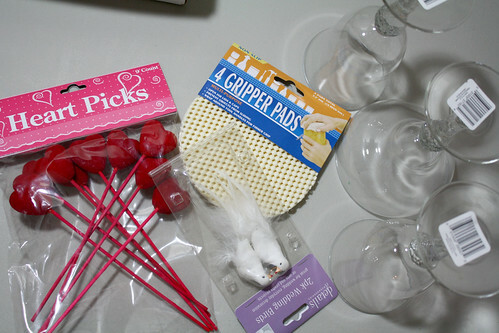 I’ll be using this idea come V-Day party time. Thank you for reminding me!! I love this idea! I am filing this at thecraftersfilebox.com. Oh no, these are SO cute!! I’ve never seen them before. And I love yours, with the vintage thread! oh those are way fun! I havent see this before. Brilliant. My gears are winding now. 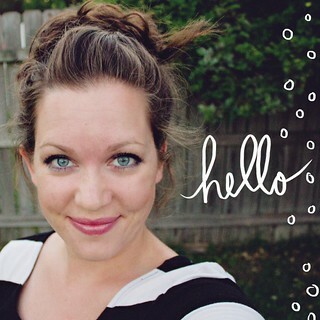 I added a picture to your Fliker group. Its our wedding cake. We did something similar for the top of it. These would be great for a party. Your new header is really cute!! I Love your Idea! I think that would look great too on a Brunch Table with a clear glass compote dish. Thanks for Sharing!! I´m very impressed of your blog. I´m still reading it for a while (from far away, because I live in Germany) and I´m very pleased about every new entry. Thanks so much for sharing your cute and brilliant ideas. These are great! 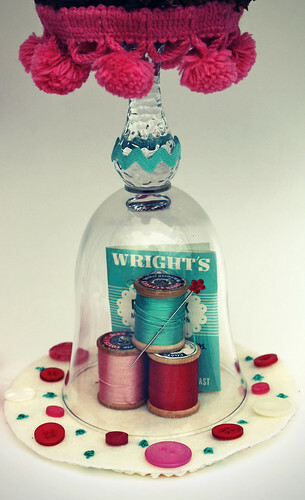 I’m linking to this in my Craft Schooling Sunday blog party, but do drop by yourself and post something else as well. Love to be inspired and love to share inspiration…so thanks!